Tylosaurinae (Williston, 1897), is reconstructed in most analyses as the sister group of the Plioplatecarpinae (Dollo, 1884). The most distinctive characteristic of the group is an elongated edentulous rostrum on the premaxilla. Members of the tylosaurine subfamily are divided into two genera: Tylosaurus (Marsh, 1874), and Taniwhasaurus (Hector, 1874). 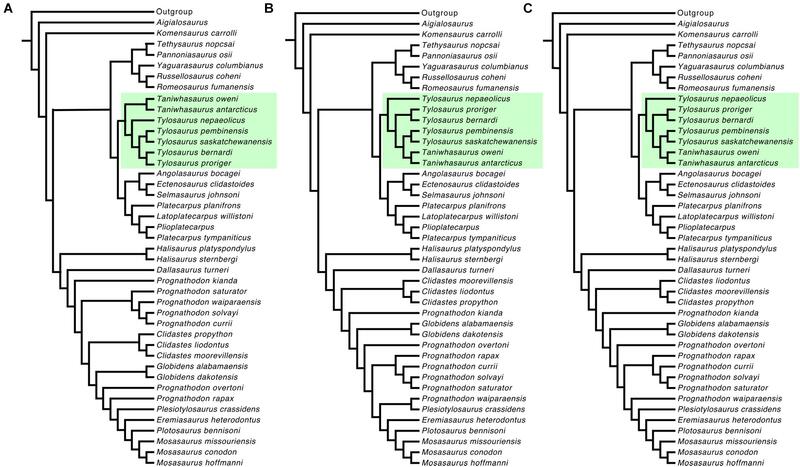 When all arguably valid tylosaurine species are included in a single phylogenetic analysis, some clades are well supported, i.e., the clade formed by T. proriger (Cope, 1869) + T. bernardi (Dollo, 1885), or the clade T. pembinensis (Nicholls, 1988) + T. saskatchewanensis. In contrast, clade relationships for other species remain unresolved, i.e., T. gaudryi (Thevenin, 1896), T. nepaeolicus (Cope, 1874), and the several species within the genus Taniwhasaurus. When T. gaudryi (Thevenin, 1896), Ta. ‘mikasaensis’ (Caldwell et al., 2008), and ‘T’. capensis (Broom, 1912) were removed from the analysis, T. nepaeolicus appeared as the basal member of the genus. The relationship within the genus Taniwhasaurus remains unresolved; however, when the problematic taxa was removed, the genus became monophyletic, with Ta. oweni as the sister group of Ta. antarcticus. Based on morphological characters present in the holotype of ‘T’. capensis Broom, 1912, we suggested a re-assignment to the genus Taniwhasaurus, based on the flutes and facets in the crown of the two preserved replacement teeth. The lack of a clear diagnosis of Hainosaurus/Tylosaurus neumilleri leaves this taxon as a nomen dubium; the few characters visible on the specimen show strong similarities to both T. pembinensis and T. saskatchewanensis; therefore, the specimen cannot be identified beyond Tylosaurus sp. Reassessment of the known materials of the Japanese species Ta. ‘mikasaensis’ suggests that the various specimens do not display sufficient diagnostic characters to support ‘mikasaensis’ as distinct from Taniwhasaurus oweni. The hypothesis for a North Atlantic Circle Basin distribution for a species of the genus Tylosaurus, from the Coniacian to the Maastrichtian is supported, and a more cosmopolitan distribution is suggested for the genus Taniwhasaurus (Santonian to Maastrichtian) with species present along the margins of the Pacific, Indian, and Antarctic Ocean Basins. Mosasaurs were a highly successful and diverse group of aquatically adapted squamates, that evolved paddle like limbs and radiated into marine environments around the world during the Upper Cretaceous (Caldwell, 2012). The Tylosaurinae (Williston, 1897), is a clade/subfamily of mosasaurs with a dense fossil record from North America (Cope, 1869, 1874; Russell, 1967; Nicholls, 1988) and Europe (Dollo, 1885; Lingham-Soliar, 1992; Lindgren and Siverson, 2002; Bardet et al., 2006; Hornung and Reich, 2015; Sachs et al., 2018), and a more sparse fossil record from Africa (Broom, 1912; Antunes, 1964), Antarctica (Novas et al., 2002), Japan (Caldwell et al., 2008), and New Zealand (Welles and Gregg, 1971; Caldwell et al., 2005). Among mosasauroids, tylosaurines include some of the largest bodied marine lizards ever known, such as T. bernardi from Belgium, which is estimated to have been 12.2 m long (Lindgren, 2005). There have been attempts to examine the position of Mosasauridae within Squamata (Rieppel, 1980; Carroll and deBraga, 1992; deBraga and Carroll, 1993; Caldwell et al., 1995; Caldwell, 1996, 1999; Conrad, 2009; Gauthier et al., 2012; Reeder et al., 2015), and the relationships of the lineages within Mosasauridae (Bell, 1993, 1997; Caldwell, 1996; Polcyn and Bell, 2005; Caldwell and Palci, 2007; Leblanc et al., 2012; Palci et al., 2013; Jiménez-Huidobro and Caldwell, 2016; Jiménez-Huidobro et al., 2018). However, none of these studies have been focused on tylosaurine mosasaurs, and none have included a revision of all tylosaurine species and thus all valid terminal taxa. Bullard (2006), in his analysis of tylosaurine mosasaurs, demonstrated the monophyly of the Tylosaurinae, and showed that Tylosaurus bernardi (=H. bernardi) and Taniwhasaurus oweni are basal members of the Tylosaurinae, while T. pembinensis and T. saskatchewanensis are crown members of the clade. However, Bullard (2006) was unable to resolve relationships between several of the tylosaurine clades. By adding a revised list of terminal taxa, derived from first hand observation of all known tylosaurine mosasaur taxa, and many specimens, to a modified version of a pre-existing data matrix, the analysis presented here seeks to establish the phylogenetic relationships of the Tylosaurinae on a global scale. A secondary goal is to assess the status of the two genera that form this group, Tylosaurus and Taniwhasaurus, and examine their distributions and clade relationships in paleobiogeographic terms. All types and specimens referred to, of the various described species of the tylosaurine mosasaurs present in the literature, were personally examined and studied by the authors. Photographs were taken using a Canon EOS 2ti and edited in Photoshop CS6 for Macintosh. Measurements were taken using a tape measure and calipers. A phylogenetic analysis was undertaken using the complete data matrix as presented in Jiménez-Huidobro et al. (2016), which itself was derived from Bell (1997); Caldwell and Palci (2007), Leblanc et al. (2012), and Palci et al. (2013). The modified data matrix of 45 ingroup taxa and 128 morphological characters was subjected to a cladistic analysis using the software TNT (Goloboff et al., 2008; Supplementary Data Sheet 1). Analytical parameters involved the use of the double New Technology search: first round using New Technology search with 1000 iterations of ratchet, sectorial searches with 1000 rounds of a consensus sectorial search, 1000 cycles of drift, and 100 rounds of tree fusing with trees obtained by random addition sequences (1000 RAS replicates) and saving all trees in RAM; second round using the New Technology search on trees saved in the RAM after the first round, using the same settings as the first round of the analysis but excluding the consensus sectorial search option. A second analysis was performed excluding T. gaudryi, Ta. ‘mikasaensis’, and ‘T’. capensis (reduced data set) as all of these terminal taxa present only a small number of scoreable characters thus leading to significant missing data in the matrix. Implied weight analysis was performed using the reduced data set, with K = 5, 10, and 15. Each implied weight analysis was completed using 1000 initial replicates and 100 trees saved per replication and TBR swapping algorithm. The outgroup taxon is the anguimorph lizard genus Varanus. The resulting cladograms were analyzed in Mesquite 3.03 for Mac, and edited in Adobe Illustrator CS6 for Mac. AMNH, American Museum of Natural History, New York, NY, United States; IAA, Instituto Antártico Argentino, Buenos Aires, Argentina; IRScNB, Institut Royal des Sciences Naturelles de Belgique, Brussels, Belgium; KHM, Kaikoura Historical Museum, Kaikoura, New Zealand; KU, University of Kansas, Museum of Natural History, Lawrence, KS, United States; MCM, Mikasa City Museum, Hokkaido, Japan; MDM, Canadian Fossil Discovery Center, Morden, MB, Canada; MMV, Manitoba Museum, Winnipeg, MB, Canada; MNHN, Muséum National d’Histoire Naturelle, Paris, France; RSM, Royal Saskatchewan Museum, T.rex Discovery Centre, Eastend, SK, Canada; SAMK, Iziko South African Museum, Cape Town, South Africa; SDSM, South Dakota School of Mines, Rapid City, SD, United States; YPM, Yale University Peabody Museum, New Haven, CT, United States. The earliest record of a tylosaurine mosasauroid belongs to a specimen from the upper Turonian of Chihuahua, northern Mexico assigned to “Tylosaurus” sp. (Loera-Flores, 2013). Another potential Turonian-age species of tylosaurine is T. imbeensis (Antunes, 1964), from the upper Turonian of Iembe, Angola. Unfortunately, the holotype was lost during a fire in Lisbon (Jacobs et al., 2006), and although there is a new specimen mentioned by Jacobs et al. (2006), it has never been described or figured. It will therefore not be considered further in this analysis as the holotype is lost and the new material remains undescribed. Figure 1. 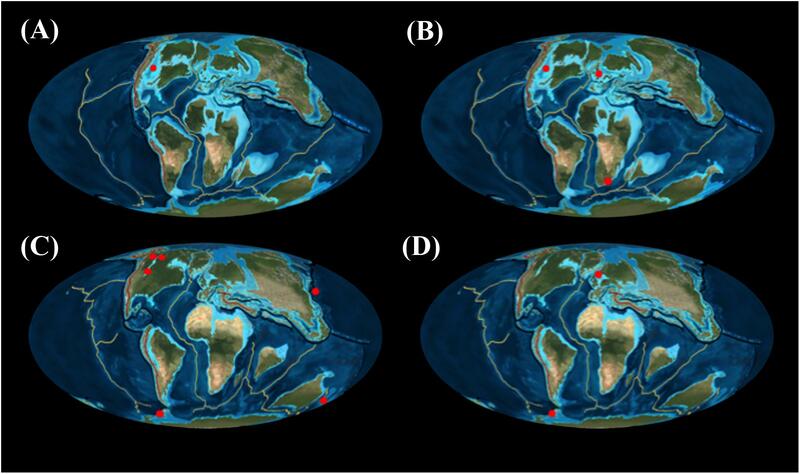 Geographical distribution of tylosaurine species, according to geochronological stages in the Late Cretaceous: (A) Coniacian; (B) Santonian; (C) Campanian; (D) Maastrichtian. Ron Blakey, Colorado Plateau Geosystems. Tylosaurus nepaeolicus was described from the upper Coniacian of the lower Smoky Hill Chalk, Kansas (Russell, 1967). The current species range is from the upper Coniacian to the lower Santonian, now ranging from the Kansas Smoky Hill Chalk (Russell, 1967) to the Boquillas Formation of Texas (Bell et al., 2012). A more recently described tylosaurine species, T. kansasensis from the upper Coniacian of the lower Smoky Hill Chalk of Kansas, has been synonymized with T. nepaeolicus (Jiménez-Huidobro et al., 2016). The generic type species of Tylosaurus proriger was recovered from the lower Campanian of the Upper Smoky Hill Chalk, near Monument Rocks, Gove County, Kansas (Cope, 1869; Everhart, 2001). This species currently ranges from the upper Santonian to the middle Campanian. Two more tylosaurine taxa from the Santonian have been found outside of North America: (1) T. gaudryi from the upper Santonian to lower Campanian of Éclusier-Vaux near Péronne, France (Thevenin, 1896); and (2) ‘T’. capensis by Broom (1912) from the Santonian of Pondoland, South Africa. The first taxon was described from an incomplete skull while the latter was described from an almost complete frontal, with fragments of the parietal and postorbitofrontal attached, as well as two jaw fragments. The Campanian of North America was characterized by a more diverse assemblage of tylosaurines: (1) T. pembinensis (Nicholls, 1988), from the middle Campanian of the Pembina Member of the Pierre Shale of Manitoba, Canada; (2) T. neumilleri (Martin, 2007) from the late Campanian of the DeGrey Formation of the Pierre Shale Group, South Dakota; (3) T. saskatchewanensis from the upper Campanian of the Bearpaw Formation of Saskatchewan, Canada. From Campanian sediments in Europe, Tylosaurus ivoensis (Persson, 1963), was described from the lower Campanian of Sweden, based on isolated teeth and vertebrae. The tylosaurine genus Taniwhasaurus also diversified during the Campanian: (1) Ta. oweni, was described from the lower Haumurian (lower to middle Campanian) of the Haumuri Bluff, Conway Siltstone Formation, South Island of New Zealand (Welles and Gregg, 1971; Caldwell et al., 2005); (2) Ta. ‘mikasaensis’ was described based on a skull block that includes an upper and lower jaws and a partial frontal, from the upper Santonian-lower Campanian boundary, near Mikasa City, central Hokkaido, Japan (Caldwell et al., 2008); (3) Ta. antarcticus was recovered from the upper Campanian to the lower Maastrichtian of the Santa Marta Formation, James Ross Island, Antarctica (Novas et al., 2002; Martin, 2006; Fernández and Martin, 2009; Fernández and Gasparini, 2012). The youngest record of tylosaurine mosasaurs is held by Tylosaurus bernardi (Dollo, 1885) from the lower Maastrichtian of the Ciply Phosphatic Chalk of Belgium. This species was formerly the type species of the genus Hainosaurus, but was recently synonymized with Tylosaurus (Jiménez-Huidobro and Caldwell, 2016). A new species of tylosaurine from the upper Maastrichtian of Antarctica was described as Kaikaifilu hervei (Otero et al., 2017). However, due to the extremely fragmentary nature of the material (most of the specimen is fragments of rock preserving natural molds and shards of bone), and the likelihood based on preserved dental characters (no complete teeth, but rather most teeth are internal casts of the pulp cavity) that it is not a tylosaurine mosasaur (PJ-H and MC pers. observ. ), it will not be included in this analysis. Two phylogenetic analyses were performed in order to hypothesize the relationships within Tylosaurinae. The first analysis used the full data set, using all valid tylosaurine taxa regardless of the incompleteness of the preserved specimens: T. proriger, T. nepaeolicus, T. pembinensis, T. saskatchewanensis, T. bernardi, Ta. oweni, Ta. antarcticus, and the incomplete materials assigned to T. gaudryi, Taniwhasaurus indet. 1 (Ta. ‘mikasaensis’), and Taniwhasaurus indet. 2 (‘T’. capensis). A second analysis was performed using a reduced data set constructed by removing all taxa represented by large amounts of missing data. The first analysis using the full data set resulted in 218 most parsimonious trees of 437 steps in length (C.I. = 0.3503; R.I. = 0.7169) (Figure 2A). The Tylosaurinae was found to be monophyletic (Bremer Support = 2; Bootstrap = 75) and appears as the sister group to the Plioplatecarpinae, similar to the results obtained by Bell (1997); Leblanc et al. (2012), and Palci et al. (2013). The genus Tylosaurus is reconstructed as monophyletic, although neither Bremer nor Bootstrap indices provide strong support for the clade. Tylosaurus nepaeolicus and T. gaudryi remain unresolved below T. proriger which was reconstructed as the sister group of T. bernardi (Bremer = 1). T. pembinensis was reconstructed as the sister group of T. saskatchewanensis (Bremer = 1). The genus Taniwhasaurus was recovered as a monophyletic group (Bremer = 1); however, the intragroup relationships remain unresolved with all four species forming a polytomy. Figure 2. Majority Rule Consensus trees: (A) Majority Rule Consensus tree obtained from 218 most parsimonious trees (MPTs) of 451 steps (C.I. = 0.3503; R.I. = 0.7169) of all tylosaurine species; (B) Majority Rule Consensus tree obtained from 103 MPTs of 448 steps (C.I. = 0.3527; R.I. = 0.7134), excluding T. gaudryi, Taniwhasaurus indet. 1 (Ta. ‘mikasaensis’), and Taniwhasaurus indet. 2 (‘T’. capensis). Values above nodes indicate Bremer (decay) indices, and below nodes indicate Bootstrap indices (only values over 50% are shown). For the second analysis, when T. gaudryi and Taniwhasaurus indet. one and two were excluded (reduced data set), the double New Technology search resulted in 103 most parsimonious trees of 435 steps each (C.I. = 0.3527; R.I. = 0.7134) (Figure 2B). 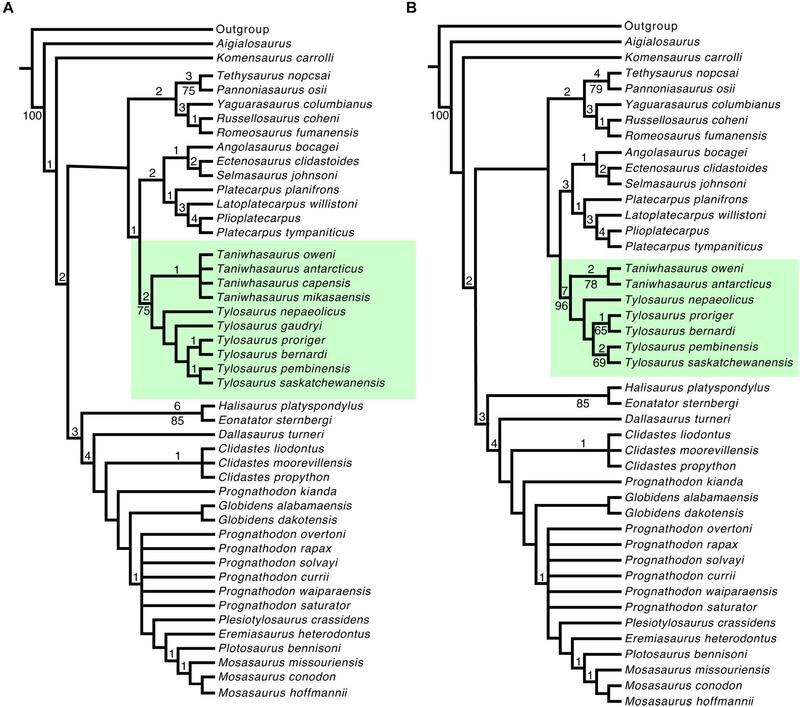 The monophyletic clade Tylosaurinae is now strongly supported (Bremer = 7 and Bootstrap = 96). The general topology of the subfamily Tylosaurinae remains similar to that found in the Majority Rule Consensus tree using the full data set. The genus Tylosaurus is reconstructed as monophyletic, although support indices are not significant. The species T. nepaeolicus is reconstructed as the most basal member of the genus. The clade T. proriger + T. bernardi was strongly supported (Bremer = 1 and Bootstrap = 65), as was the clade composed of T. pembinensis and T. saskatchewanensis (Bremer = 2 and Bootstrap = 69). The genus Taniwhasaurus was found to be monophyletic (Bremer = 2 and Bootstrap = 78) with Ta. oweni as the sister group to Ta. antarcticus. Implied weights analysis was performed using the reduced data set, with constant concavity values K = 5, 10, and 15. Using K = 5 resulted in a single best fit tree of 32.985 fit score and 437 steps (C.I. = 0.3616; R.I. = 0.7243), showing the same topology as the Majority Rule Consensus tree shown in Figure 2B. The results of K = 10 show a single best-fit tree of 20.41 fit score and 435 steps (C.I. = 0.3632; R.I. = 0.7263). Finally, the constant K = 15 resulted in a single best-fit tree of 14.84 fit score and 435 steps (C.I. = 0.3632; R.I. = 0.7263). When the synapomorphies are mapped onto the best fit tree with K = 5, the topology of the cladogram is consistent with the Majority Rule Consensus tree obtained using the reduced data set (Figure 3A). The subfamily Tylosaurinae appears to be distinguished by characters 2 , 6 , 12 , 15 , 28 , 57 , 58 , 77  (Supplementary Data Sheet 2) as in both double New Technology search analyses. In addition to those, the subfamily is characterized by having the prefrontal in contact with the postorbitofrontal (character 27 ), and the absence of zygosphenes and zygantra (character 81). The genus Tylosaurus is differentiated by character 91 , as in the double New Technology search analyses. The clade formed by T. proriger and T. bernardi as sister group of T. saskatchewanensis and T. pembinensis is distinguished by the same characters as in the Majority Rule Consensus tree generated by the reduced data set (character 32  and 42 ). The clade formed by T. proriger and T. bernardi is differentiated by character 47 , as in the Majority Rule Consensus trees with both full and reduced data set. The clade formed by T. saskatchewanensis and T. pembinensis is characterized by the same characters as for the double New Technology search analyses (character 69 , 72 , 88 ). The autapomorphy distinguishing T. nepaeolicus is the same character as in the New Technology search analyses (character 37 ∗) (autapomorphic character indicated by ∗). The genus Taniwhasaurus is characterized by characters 4 , 5 , 10 , 72 , and 73 , as in the double New Technology search analyses. To differentiate Ta. oweni, characters are the same than the resulted for the New Technology search analyses (character 42 ∗, 56 ∗). When the synapomorphies are mapped onto the best fit tree with K = 10 and 15, the results are exactly the same: the subfamily Tylosaurinae is characterized by the same characters as in the Implied weight using K = 5, in addition to the “basioccipital tubera anteroposteriorly elongate with rugose ventrolateral surfaces (character 54 )”, and “vertebral length almost equal or are the longest (character 91 ).” Neither Tylosaurus nor Taniwhasaurus appear as monophyletic (Figures 3B,C). The species T. nepaeolicus can be distinguished by character 37 , as well as by the quadrate posteroventral ascending tympanic rim high, elongate triangular crest (character 45 ), and a thick quadrate ala (character 46 ). Figure 3. Majority Rule Consensus trees from the Implied Weight analysis, using the reduced data set: (A) Majority Rule Consensus tree of the single best tree of 32.985 fit score and 437 steps, K = 5 (C.I. = 0.3616; R.I. = 0.7243); (B) Majority Rule Consensus tree of the single best tree of 20.41 fit score and 435 steps, K = 10 (C.I. = 0.3632; R.I. = 0.7263); (C) Majority Rule Consensus tree of the single best tree of 14.84 fit score and 435 steps, K = 15 (C.I. = 0.3632; R.I. = 0.7263). Subfamily Tylosaurinae – The subfamily Tylosaurinae appears to be distinguished by characters 2 , 6 , 12 , 15 , 28 , 57 , 58 , 77 , as in both double New Technology search analyses. In addition to those, the subfamily is characterized by having the prefrontal in contact with the postorbitofrontal (character 27 ), and the absence of zygosphenes and zygantra (character 81). The genus Tylosaurus is differentiated by character 91 , as in the double New Technology search analyses. The clade formed by T. proriger and T. bernardi as the sister group to T. saskatchewanensis and T. pembinensis, is distinguished by the same characters as in the Majority Rule Consensus tree generated by the reduced data set (character 32  and 42 ). The clade formed by T. proriger and T. bernardi is differentiated by character 47 , as in the Majority Rule Consensus trees with both the full and reduced data set. The clade formed by T. saskatchewanensis and T. pembinensis is characterized by the same characters as were found to support the double New Technology search analyses (character 69 , 72 , 88 ). The autapomorphy distinguishing T. nepaeolicus is the same character as in the New Technology search analyses (character 37 ∗). The genus Taniwhasaurus is characterized by characters 4 , 5 , 10 , 72 , and 73 , as in the double New Technology search analyses. To differentiate Ta. oweni, characters are the same as those found by the New Technology search analyses (character 42 ∗, 56 ∗). When the synapomorphies are mapped onto the best fit tree with K = 10 and 15, the results were exactly the same: the subfamily Tylosaurinae was characterized by the same characters as in the Implied weight using K = 5, in addition to the “basioccipital tubera anteroposteriorly elongate with rugose ventrolateral surfaces (character 54 )”, and “vertebral length almost equal or are the longest (character 91 ).” The species T. nepaeolicus can be distinguished by character 37 , as well as by the quadrate posteroventral ascending tympanic rim high, elongate triangular crest (character 45 ), and a thick quadrate ala (character 46 ). Genus Tylosaurus – The results of our phylogenetic analysis support the monophyly of the subfamily Tylosaurinae (Figure 2). Character state distributions provide the following synapomorphies: (1) premaxilla predental rostrum very large and inflated (character 2 ); (2) premaxilla internarial bar dorsal keel present (character 6 ); (3) frontal olfactory canal embrasure not embraced ventrally by descending processes (character 12 ); (4) frontoparietal suture overlap with all three ridges almost horizontal (character 15 ); (5) prefrontal-postorbitofrontal overlap laterally (character 28 ); (6) dentary with projection anterior to first tooth present (character 57 ); (7) dentary anterior projection long (character 58 ); (8) tooth carinae with serrations (character 77 ); (9) vertebrae without zygosphenes and zygantra (character 78 ). When T. gaudryi, Ta. ‘mikasaensis’, and ‘T’. capensis are removed from the analysis, the characters that define the subfamily are the same characters obtained in the analysis using the full data set (character 2 , 6 , 12 , 15 , 28 , 57 , 58 , 77 , 78 ). The diagnosis of the subfamily seems to be better supported in the last analysis, when most of the missing data are excluded. In the first analysis, the genus Tylosaurus was resolved as a monophyletic group distinct from Taniwhasaurus. When all taxa were included (Figure 2A), T. gaudryi appeared in a polytomy with T. nepaeolicus and the other species of Tylosaurus. The genus Tylosaurus was distinguished by the character and state of almost equal or longer cervical vertebrae (character 91 ). In the second analysis, the autapomorphy that characterizes the genus was the same as the one obtained in the full data set (character 91 ). With Tylosaurus gaudryi, Ta ‘mikasaensis’, and ‘Tylosaurus’ capensis removed from the analysis, T. nepaeolicus was revealed as basal to the geologically younger Tylosaurus species (T. proriger, T. bernardi, T. pembinensis, and T. saskatchewanensis) (Figure 2B). In both analyses, the clade formed by T. proriger, T. bernardi, T. saskatchewanensis, and T. pembinensis was characterized by having the maxillo-premaxillary suture posterior terminus between the fourth and ninth maxillary teeth (character 32 ). The two younger North American tylosaurines, T. pembinensis and T. saskatchewanensis, were characterized by the following autapomorphies: (1) lateral sutural flange and median sutural flange of the frontal posteriorly extended to invade the parietal (16); (2) the articular retroarticular process presents an extreme inflection of almost 90°, appearing nearly horizontal (character 69 ); (3) teeth surface very coarsely ornamented with bumps and ridges (character 72 ); (4) vertebral condyle shape essentially equidimensional (character 88 ). In the second analysis, using the reduced data set, the group was defined by the same characters (69 , 72 , 88 ), except character 16 (2), which no longer had a synapomorphy for the clade when the reduced data set was used. In both analyses, T. proriger and T. bernardi appeared as sister groups characterized by a single autapomorphy: quadrate conch with shallow alar concavity (47). Genus Taniwhasaurus – The genus Taniwhasaurus was reconstructed as a monophyletic group, distinguished by: (1) having the internarial bar of the premaxilla being wide, barely narrower than the rostrum (character 4 ); (2) premaxilla internarial bar base rectangular (character 5 ); (3) teeth coarsely ornamented with bumps and ridges (character 72 ); (4) tooth facets present (character 73 ). In the second analysis using the reduced data set, the genus was supported by the same characters (4 , 5 , 72 , 73 ), and additionally by the presence of a high, thin, and well-developed frontal midline dorsal eminence (character 10 ). In the first analysis, ‘T’. capensis, Ta. oweni, Ta. antarcticus, and Ta. ‘mikasaensis’ formed an unresolved polytomy. When ‘T’. capensis, Ta. ‘mikasaensis’, and T. gaudryi were removed (large numbers of missing data), the relationship between Ta. oweni and Ta. antarcticus naturally resolved and the two taxa formed a clade. When the diagnostic characters (autapomorphies) for Ta. oweni (Caldwell et al., 2005) and Ta. antarcticus (Novas et al., 2002; Martin and Fernández, 2007; Fernández and Martin, 2009) were compared, the characters that diagnose them are centered on the shape of the frontoparietal suture (almost straight in Ta. antarcticus, compared to wavy in Ta. oweni), and the absence of facets in the teeth of Ta. antarcticus, compared to the faceted teeth of Ta. oweni. Only a few specimens have been assigned to Ta. antarcticus (Fernández and Gasparini, 2012): (1) the holotype, which is the most complete and best preserved; (2) and a partial skull of a juvenile specimen from Vega Island (Martin et al., 2007). Additional materials from Vega and Seymour Islands that refer to the species include nothing more than isolated and poorly preserved vertebrae and teeth. The species from New Zealand, Ta. oweni, was poorly described and characterized in the literature until a new specimen was found at the Haumuri Bluff and the taxon was recharacterized and re-diagnosed (Caldwell et al., 2005). The only specimen available of ‘T’. capensis shows more affinities with Taniwhasaurus sp., than Tylosaurus. The flutes visible on the tooth crowns have not been seen in any species of Tylosaurus, and it is considered here diagnostic for the genus Taniwhasaurus (Martin and Fernández, 2007; Caldwell et al., 2008). Therefore, it was removed from our study on Tylosaurus and placed in Taniwhasaurus. This re-assignment expands the geographic range of the genus Taniwhasaurus to the Indian Ocean. The taniwhasaur Ta. ‘mikasaensis’ does not possess sufficient diagnostic characters to be considered a different species, since the anatomy exhibited by the holotype and referred specimens are diagnostic to the genus Taniwhasaurus. Therefore, it was considered appropriate to assign the Japanese specimens to the generic level, as indeterminate species of Taniwhasaurus. Type Species – Tylosaurus proriger (Cope, 1869) from Niobrara Formation, Western Kansas, United States. Generic Diagnosis – (1) twelve to thirteen maxillary teeth; (2) prefrontal does not contribute to external nares; (3) frontal overlaps supraorbital portion of prefrontal; (4) frontal does not contribute to the orbit; (5) ventroposterior process on jugal present; (6) ten to eleven pterygoid teeth; (7) broad projection of dentary anterior to first dentary tooth; (8) thirteen teeth on dentary; (9) if teeth present carina, it have serrations; (10) unfluted marginal teeth; (11) six to seven pygals, 33–34 caudal chevron-bearing and 56–58 terminal caudals; (12) scapula smaller than coracoid, convex superior border of scapula; (13) radial process absent in the humerus; (14) elongated radius, same length of metacarpal one and two; (15) ischium well expanded medially at symphysis; (16) distal end of femur more expanded than proximal; (17) phalangeal formula of pes 5-8-8-8- (modified from Russell, 1967). 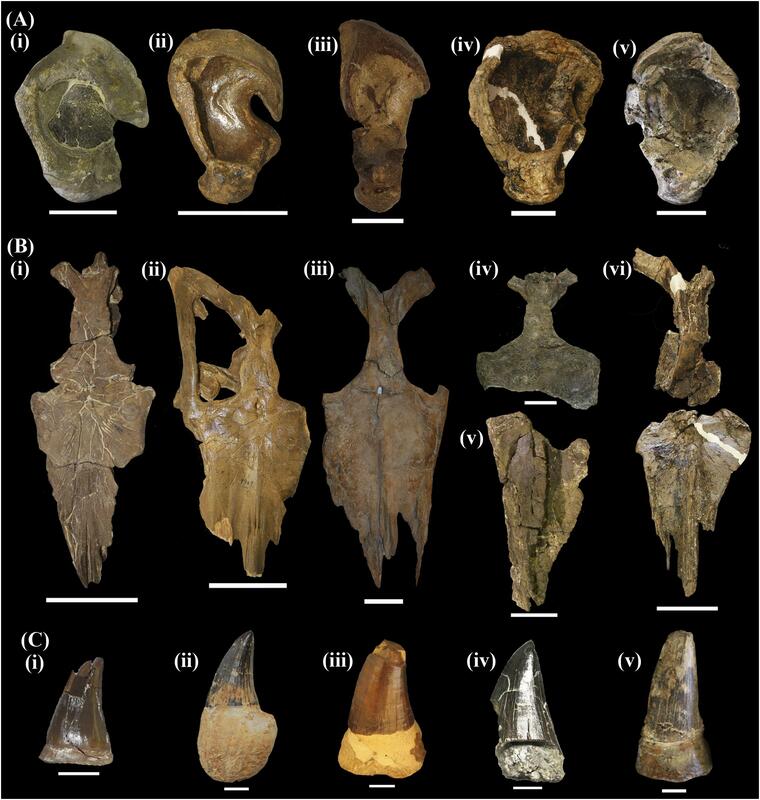 Locality/Age – Turonian to lower Maastrichtian (Dollo, 1885; Loera-Flores, 2013; Jiménez-Huidobro and Caldwell, 2016). Figure 4. Specimens assigned to the genus Tylosaurus. (A) T. proriger KU 66129; (B) T. nepaeolicus AMNH 124, 134; (C) T. bernardi IRScNB 3672; (D) T. saskatchewanensis (holotype) RSM P2588.1; (E) T. pembinensis MMV 95 2. All scale bars equal to 100 mm. Revised diagnosis – (1) maxilla-premaxillary suture terminates posterior to the fourth maxillary tooth; (2) suprastapedial process of the quadrate long, reaches about midheight of the shaft; (3) infrastapedial process of the quadrate moderately developed; (4) tympanic ala thin (Figure 5A); (5) frontal with well-developed medial crest; (6) prefrontal overlaps with postorbitofrontal; (7) frontal invades posteriorly the parietal through dorsal, medial, and lateral alae (Figure 5B); (8) teeth without flutes (Figure 5C); (9) humerus and femur equal in length. Figure 5. Comparison of cranial elements of different Tylosaurus species: (A) quadrate of: (i) T. nepaeolicus YPM 3970; (ii) T. proriger AMNH 4909; (iii) T. bernardi IRScNB 3672; (iv) T. pembinensis MDM M740506; (v) T. saskatchewanensis RSM P2588.1; (B) frontal and parietal of: (i) T. nepaeolicus YPM 3974; (ii) T. proriger AMNH 4909; (iii) T. bernardi IRScNB R23; (iv) T. pembinensis MMV 95; (v) T. pembinensis MMV 95; (vi) T. saskatchewanensis RSM P2588.1; (C) teeth of: (i) T. nepaeolicus YPM 3969; (ii) T. proriger AMNH 1543; (iii) T. bernardi IRScNB 3672; (iv) T. pembinensis MDM M770507; (v) T. saskatchewanensis RSM P2588.1. Scale bars of (A) equal to 50 mm, scale bars of (B) equal to 100 mm, scale bars of (C) equal to 10 mm. Locality/Age – upper Santonian to lower Campanian of the Kansas Chalk, Niobrara Formation (Cope, 1869; Russell, 1967), Mooreville Chalk of Alabama (Applegate, 1970; Kieran, 2002), Taylor Group of Texas, and the Pierre Shale of Kansas and South Dakota (Russell, 1967). Synonymy – Tylosaurus kansasensis (Everhart, 2005). Diagnosis – T. nepaeolicus differs from other species of Tylosaurus by the following combination of character-states: (1) premaxillo-maxillary suture terminates posteriorly above midpoint between third and fourth maxillary tooth; (2) prefrontal overlaps with postorbitofrontal; (3) frontal with dorsal medial midline poorly developed or absent in adult; (4) lateral borders of parietal table slightly convex (Figure 5B); (5) ∗ectopterygoid does not contact with maxilla; (6) infrastapedial process of quadrate poorly developed or absent; (7) suprastapedial process of quadrate long, reaching about half length of complete bone; (8) tympanic ala thick; (9) mandibular condyle of the quadrate lateromedially broad (Figure 5A); (10) lateral crest of tympanic ala ends posteriorly near mandibular condyle (modified from Jiménez-Huidobro et al., 2016). Locality/Age – Lower Smoky Hill Chalk, Niobrara Formation, Kansas, from the upper Coniacian to lower Santonian. Diagnosis – (1) vertical ramus of jugal thick; (2) vertical ramus of jugal presents visible suture to articulate with postorbitofrontal, not deep excavation; (3) tympanic ala of quadrate thin (Figure 5A); (4) frontal midline dorsal eminence present; (5) parietal table rectangular in shape, wider in anterior than posterior end (Figure 5B); (6) ventromedial process of postorbitofrontal projects laterally (Jiménez-Huidobro and Caldwell, 2016). Locality/Age – upper Lower Maastrichtian Ciply Phosphatic Chalk, in La Malogne, near the town of Mesvin, Mons Basin, southwestern Belgium (Robaszynski and Martin, 1988; Robaszynski, 1989; Robaszynski and Christensen, 1989). Diagnosis – (1) extensive overlap of premaxilla onto frontal; (2) anterior process of frontal extending anteriorly up to half of length of external nares; (3) frontal with well-developed dorsal midline crest (Figure 5B); (4) exclusion of prefrontal from dorsal rim of orbit, by long anterior process of postorbitofrontal; (5) suprastapedial process of quadrate moderate in size; (6) infrastapedial process of quadrate rounded, and located high on quadrate shaft, almost touching suprastapedial process (Figure 5A); (7) tympanic ala of quadrate thick; (8) femur longer than humerus; (9) 55 (+8) vertebrae anterior to chevron bearing caudals; (10) rounded astragalus with big semicircular crural foramen. Locality/Age – near Herbert Ferry on the shore of Lake Diefenbaker, Snakebite Member, Bearpaw Fm., Saskatchewan, Canada, upper Campanian (Kauffman and Caldwell, 1993). Diagnosis – (1) external nares relatively long, extending from fourth to twelfth maxillary tooth and constituting 28–31% of skull length; (2) postorbitofrontal overlapping prefrontal above orbit; (3) on quadrate, suprastapedial process of moderate length, medially deflected and tapered at its tip, infrastapedial process small, placed high on lower half of shaft (Figure 5A); (4) supratemporal fenestra long, constituting 24% of skull length; (5) femur longer than humerus (Bullard and Caldwell, 2010). Locality and Horizon – MDM quarry 18 (North Cox Pit) in the Pembina Member of the Pierre Shale. earliest middle Campanian age (Gill and Cobban, 1966; Kauffman et al., 1993). Figure 6. Holotype and only specimen referred to T. neumilleri SDSM 75705, from the Campanian of the Pierre Shale of South Dakota. (A) Fragment of premaxilla and maxilla; (B) parietal table and coronoid; (C) left quadrate; (D) fragment of right articular. All scale bars equal to 100 mm. Original Diagnosis – medium-sized tylosaurine mosasaur with (1) premaxillary-maxillary suture sinusoidal in shape (Figure 6A); (2) parietal foramen in frontoparietal suture (Figure 6B); (3) relatively wide snout; (4) quadrate with large, deep, bowl-shaped excavation incorporating stapedial pit and covering much of medial quadrate (Figure 6C); (5) suprastapedial with relatively long internal process; (6) suprastapedial deflected laterally compared with axis perpendicular to distal condyle; (7) teeth relatively well faceted and symmetrically flattened. Locality and Horizon – V2005-20 Gregory County, from the upper Campanian of the DeGrey Formation, lower Pierre Shale, South Dakota (Martin, 2007). Remarks – The preserved anatomy of materials assigned to T. neumilleri are virtually indistinguishable from similar materials described in T. saskatchewanensis and T. pembinensis, such as the similarly elongated parietal with the parietal table straight in the lateral outline (Figure 6B), a quadrate with a long suprastapedial process that reaches the midheight of the shaft, a well-developed infrastapedial process located high on the quadrate shaft (Figure 6C), posteriorly curved and labiolingually compressed teeth that are ornamented with facets and fine striations (although unflutted), and teeth that bear serrated carinae with small denticles. Several of the characters used by Martin (2007) in the original diagnosis are also not diagnostic. Anatomies present in other mosasauroids show that the suprastapedial process is deflected in adult specimens but not necessarily in subadults, suggesting ontogenetic variability not species differences (Jiménez-Huidobro et al., 2016). The position of the parietal foramen was previously considered diagnostic to the species-level (Lingham-Soliar, 1992), though more recent research has shown that it can vary intraspecifically among squamates, affected by many factors, including ontogeny (Barahona and Barbadillo, 1998; Bell et al., 2003; Jiménez-Huidobro et al., 2016). In addition, the shape of the frontoparietal suture is another very plastic character amongst squamates. It has been recognized that shape is intraspecifically variable, and is linked to allometric growth through ontogeny, and/or sexual dimorphism (Barahona and Barbadillo, 1998; Bell et al., 2003; Simões et al., 2016). No confirmed evidence of sexual dimorphism has been found in mosasauroid lizards. Type Species – Taniwhasaurus oweni (Hector, 1874) from the Campanian of Haumuri Bluff, Conway Siltstone Formation, South Island, New Zealand. Generic Diagnosis – (1) prefrontal excluding maxilla from contact with frontal; (2) frontal shield-shaped rather than triangular; (3) narial opening beginning between third and fourth maxillary tooth; (4) thirteen to fourteen teeth in maxilla; (5) posteroventral process of jugal present; (6) thirteen to fourteen dentary teeth; (7) marginal dentition distally slender, posteromedially recurved with narrow and distinct lateral fluting and medial striation (8); if teeth carinate, no serrations; (9) predental rostrum of premaxilla with dorsal sagittal crest; (10) base of ectopterygoid process broad anteroposteriorly; (11) distal end of ectopterygoid process forming thick, rounded tubercle facing ventrolaterally and slightly posteriorly; (12) quadrate shaft distinctly deflected laterally around midheight; (13) infrastapedial process small; (14) suprastapedial process roughly 50% or more of quadrate height; (15) suprastapedial process not constricted in dorsal view (modified from Caldwell et al., 2005). Locality/Age – upper Santonian to lower Maastrichtian (Novas et al., 2002; Caldwell et al., 2008). Figure 7. Specimens assigned to the genus Taniwhasaurus. (A) Ta. oweni KHM N99-1014/1-5; (B) Ta. antarcticus (holotype) IAA 2000-JR-FSM-1. Scale bars equal to 100 mm. Synonymy – Leiodon haumuriensis (Hector, 1874). Tylosaurus haumuriensis (Hector) (Williston, 1898). Revised diagnosis – (1) prefrontal excluding maxilla from contact with frontal; (2) broad overlap of prefrontal and postorbitofrontal above orbit (Figure 8A), excluding frontal from orbital margin; (3) frontal shield-shaped rather than triangular; (4) predental rostrum of premaxilla with dorsal sagittal crest; (5) ∗quadrate suprastapedial ridge wide, broadly rounded, and curving downward especially above stapedial pit (Figure 8B); (6) infrastapedial process small (modified from Caldwell et al., 2005). Figure 8. Comparison of cranial elements of Taniwhasaurus. (A) Postorbitofrontal: (i) Ta. oweni KHM N99-1014/1-5; (ii) Ta. antarcticus IAA 2000-JR-FSM-1. Scale bars equal to 50 mm; (B) quadrate: (i) Ta. oweni KHM N99-1014/1-5; (ii) Ta. antarcticus IAA 2000-JR-FSM-1. Scale bars equal to 50 mm; (C) teeth: (i) Ta. oweni KHM N99-1014/1-5; (ii), Ta. antarcticus IAA 2000-JR-FSM-1. Scale bars equal to 20 mm; (D) jugal: (i) Ta. oweni KHM N99-1014/1-5; (ii) Ta. antarcticus IAA 2000-JR-FSM-1. Scale bars equal to 50 mm. Locality/Age – Haumuri Bluff, Conway Siltstone Formation, south of Kaikoura, South Island, New Zealand. The horizon is lower Haumurian (lower-middle Campanian). Synonymy – Lakumasaurus antarcticus Novas et al., 2002. Revised diagnosis – (1) prefrontal forming part of the narial opening; (2) broad overlap of prefrontal and postorbitofrontal above orbit, excluding frontal from orbital margin; (3) frontal with relatively straight lateral sides; (4) striated dentition (Figure 8C); (5) premaxilla with dorsal ridge; (6) long, narrow dorsal margin of quadrate; (7) suprastapedial process of quadrate long, deeply grooved; (8) infrastapedial process small (Figure 8B); (9) ventromedial suture of prefrontal sigmoidal rather than broadly convex. Locality/Age – Dinosaurio River, Santa Marta Formation, James Ross Island, Antarctica, uppermost Campanian (Crame et al., 2004). Figure 9. The problematic taxa: (A) holotype of Ta. ‘mikasaensis’ reassigned to Taniwhasaurus indet. 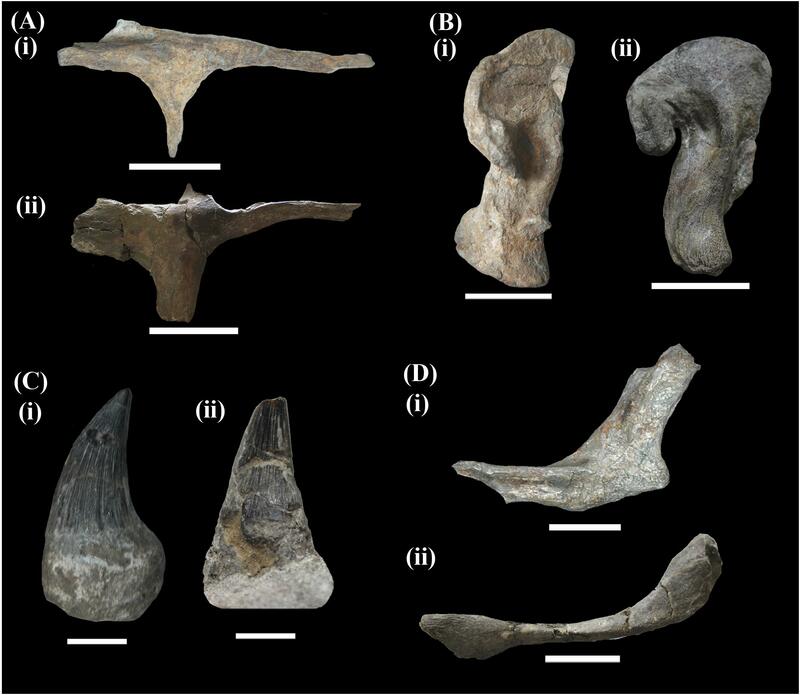 1, from de Santonian – early Campanian of Hokkaido, Japan MCM.M0009, scale bar equal to 100 mm; (B) holotype of former “Tylosaurus capensis,”, reassigned to Taniwhasaurus indet. 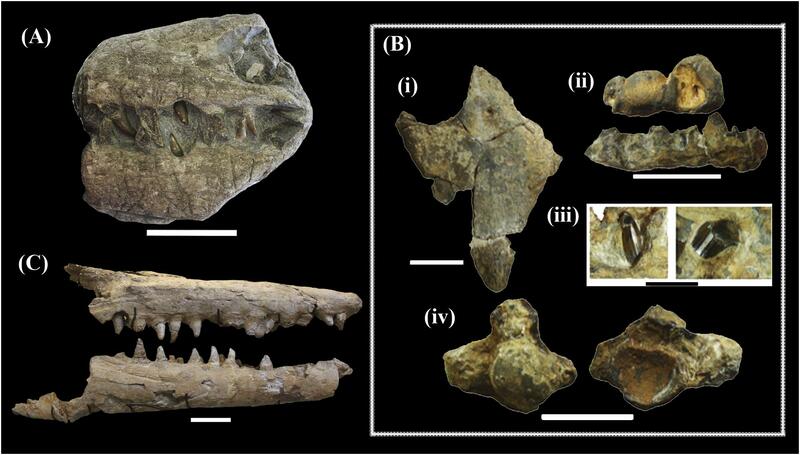 2, from the Santonian of Pondoland, South Africa SAM-PK-5265: (i) frontal with fragments of parietal and both postorbitofrontals, scale bar equal to 10 cm; (ii) jaw fragments, scale bar equal to 100 mm; (iii) close up of replacement teeth, scale bar equal to 20 mm; (iv) cervical vertebra, left shows in condyle view, right shows in cotyle view, scale bar equal to 50 mm; (C) holotype of Tylosaurus gaudryi from the Santonian of Éclusier-Vaux, France MNHN 1896-15, scale bar equal to 100 mm. Locality/Age – East bank of Kikumen Creek, near to Mikasa city, Hokkaido, Northern Japan. The horizon is upper Santonian – lower Campanian. Remarks – The holotype assigned to Ta. ‘mikasaensis’ MCM.M0009 is a large, partial skull preserved in three dimensions and bears a number of teeth. The dental characters present in this specimen are attributable to the genus Taniwhasaurus, such as the presence of flutes on the crowns, a characteristic observed in Ta. oweni (Caldwell et al., 2005) and Ta. antarcticus (Martin and Fernández, 2007). The lack of serrations on the carinae is also a characteristic observed in Taniwhasaurus. Referred materials include a number of skulls and isolated vertebral elements. The squamosal process of the postorbitofrontal is long, extending almost to the posterior end of the supratemporal fenestra, as in Ta. antarcticus; the posterior process of the postorbitofrontal is not known in Ta. oweni. The internarial bar of the premaxilla overlaps with the anterior portion of the frontal, as in all tylosaurine mosasaurs, overlapping almost at the level of the anterior border of the orbit as in T. saskatchewanensis (Jiménez-Huidobro et al., 2018). The jugal does not show any unique characters, but is broadly similar to the jugal of Ta. oweni (Caldwell et al., 2005) where the vertical ramus is slightly recurved posteriorly. Locality/Age – Santonian-aged Chalk of the Transkei Formation (=Pondoland), South West of Umzamba, South Africa. Remarks – The original diagnosis given by Lingham-Soliar (1992) noted the size of the parietal foramen and its distance from the frontoparietal suture. However, both characteristics are highly variable within the genus Tylosaurus (Jiménez-Huidobro and Caldwell, 2016) and are not considered diagnostic at the species level. The holotype and only specimen represents the remains of a very large tylosaurine. It consists of a large and rather smooth frontal bone where the frontal midline crest is absent, thus differing from the frontals of Ta. antarcticus and Ta. oweni (Novas et al., 2002; Caldwell et al., 2005). Both median sutural flanges (cf. Bell, 1997) are visibly rounded, not sharp or pointed, and the lateral sutural flanges are not developed. The result is a frontoparietal suture that is mildly sinusoidal in form. The anterior portion of the parietal is attached to the frontal, and parietal opening is located within the parietal, far from the frontoparietal suture. Fragments of both the left and right postorbitofrontals are attached to each side of the frontal. Jaw fragments are included in the type, but there is little data preserved that merits description here. There is a complete replacement tooth in one jawbone fragment along with a fragmented replacement tooth, the latter of which has a broken crown tip. The teeth are cylindrical in shape, sharp, and slightly labiolingually compressed. Both preserved teeth are fluted or faceted, differing from those in the various Tylosaurus species, which have no flutes or facets; this dental morphology is similar to the ornamentation seen in teeth of Ta. oweni and Ta. antarcticus. In addition, it has been established that the fluting condition of the crown is a character seen only in the genus Taniwhasaurus amongst tylosaurines (Martin and Fernández, 2007; Caldwell et al., 2008). However, due to preservation, it is not possible to establish the presence of carinae. A phylogenetic analysis including all known and valid tylosaurine taxa was performed in order to construct a hypothesis of relationships between tylosaurine mosasaurs. The results of the phylogenetic analysis support the monophyly of the clade Tylosaurinae, as suggested by Bullard (2006), though contrasts Bell (1997), who suggested that the inclusion of T. bernardi (=H. bernardi) in the analysis would demonstrate the paraphyletic nature of the group. Two clades of Tylosaurus were recovered: (1) T. proriger from the upper Santonian-lower Campanian of the Western Interior Seaway, and T. bernardi from the lower Maastrichtian of Belgium; (2) T. pembinensis from the middle Campanian of North America, and T. saskatchewanensis from the upper Campanian, also from North America. The earliest recognized species, T. nepaeolicus from the upper Coniacian-lower Santonian of the Western Interior Seaway, was recovered as basal to the clades formed by the other four species of Tylosaurus. 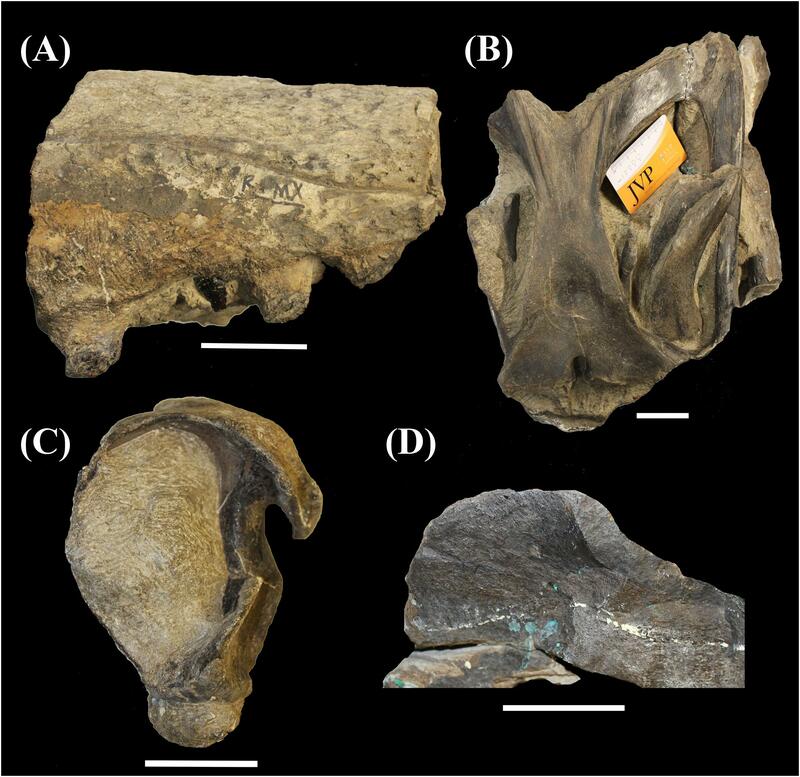 Although the quadrate is generally considered as diagnostic among mosasauroids, the only known specimen of T. neumilleri shows characterics that are shared with both T. pembinensis and T. saskatchewanensis. The material assigned to T. neumilleri (Figure 6) does not allow an assignation to species level, making more material to diagnose it necessary. Since there is no clear diagnosis of the specimen, we recognized a nomen dubium status of Hainosaurus/Tylosaurus neumilleri, and tentatively assigned the material to Tylosaurus sp. The genus Taniwhasaurus is not a monophyletic assemblage when all taxa are treated as terminals in a comprehensive phylogenetic analysis. However, when the poorly known species of Taniwhasaurus and Tylosaurus were removed from the analysis, the remaining taxa form a monophyletic group within Tylosaurinae. Taniwhasaurus oweni from the lower-middle Campanian of New Zealand, and Ta. antarcticus from the upper Campanian-lower Maastrichtian of Antarctic Peninsula were distinguished from each other by only a small number of characters (i.e., unfaceted teeth and almost straight frontoparietal suture in Ta. Antarcticus). Unfortunately, none of the species are known from complete specimens, making it difficult to differentiate them. Therefore, the conservative approach taken here is in order to retain these taxa until new data either supports them as distinct or suggests synonymization. Taniwhasaurus indet. 1 (Ta. ‘mikasaensis’) does not preserve sufficient diagnostic characters to be recognized as a distinct species; the characters exhibited by the holotype and referred specimens are shared with other species of Taniwhasaurus, but nothing is preserved that supports certain species distinction. Therefore, it was considered appropriate to assign the Japanese specimens to a generic level, i.e., Taniwhasaurus indet. 1. The only specimen available for Taniwhasaurus indet. 2 (‘T’. capensis) shows more affinities with Taniwhasaurus than Tylosaurus. The flutes visible on the tooth crowns have not been observed in any species of Tylosaurus, and were considered here to be diagnostic for the genus Taniwhasaurus (Martin and Fernández, 2007; Caldwell et al., 2008). T. capensis was therefore removed from Tylosaurus and placed in Taniwhasaurus. This re-assignment expands the geographic range of the genus Taniwhasaurus to the Indian Ocean. The alpha taxonomy of the Tylosaurinae (Williston, 1897), is now significantly modified, resulting in a much more restricted concept of “tylosaurine mosasaur” as a group of mosasauroids that range temporally from the Coniacian to the Maastrichtian. Two genera are recognized, Tylosaurus (Marsh, 1874), and Taniwhasaurus (Hector, 1874). Valid species of Tylosaurus include the North American T. nepaeolicus (Cope, 1874), from the upper Coniacian to lower Santonian of the Niobrara and Boquillas Formations (Russell, 1967; Bell et al., 2012), T. proriger from the upper Santonian to lower Campanian of the Niobrara and Mooreville Chalk Formations and the Taylor Group (Russell, 1967), T. pembinensis from the lower-middle Campanian of the Pembina Member of the lower Pierre Shale Formation (Nicholls, 1988; Bullard and Caldwell, 2010), and T. saskatchewanensis from the upper Campanian of the Bearpaw Formation and the lower Pierre Shale Formation (Jiménez-Huidobro et al., 2018). Valid species of European tylosaurines include T. bernardi from the lower Maastrichtian of the Ciply Phosphatic Chalk Formation of Belgium (Hector, 1874; Jiménez-Huidobro and Caldwell, 2016), and T. gaudryi from the Santonian of France (Thevenin, 1896; Lindgren, 2005). The distribution of the genus in North America is recognized from the late Turonian of Chihuahua (Loera-Flores, 2013), Mexico, to the late Campanian of Saskatchewan and South Dakota, while the global distribution is extends to the early Maastrichtian of Belgium, reaching the North Atlantic Circle Basin of North America and Europe. The species recognized from the genus Taniwhasaurus include Ta. oweni (Hector, 1874), from the lower-middle Campanian of New Zealand (Welles and Gregg, 1971; Caldwell et al., 2005), and Ta. antarcticus Novas et al., 2002, from the late Campanian to the early Maastrichtian of Antarctica (Martin and Fernández, 2007; Fernández and Gasparini, 2012). To date, most of the tylosaurine fossil record has mainly been recovered from North America, and most of that comes from marine deposits in the Western Interior Seaway. The European record includes complete and diagnosable material from Belgium (T. bernardi), in addition to fragmented and incomplete material, not possible to diagnose other than at the subfamily or generic level, such as an isolated tooth from the Turonian of Italy (Romano et al., 2019), isolated dental and vertebral material from Sweden (Lindgren, 2005), isolated dental remains from Germany (Hornung and Reich, 2015), an isolated tooth from Poland (Jagt et al., 2005), another isolated tooth from Spain (Bardet et al., 2006), and the material assigned to T. gaudryi from the Santonian of France (Thevenin, 1896; Figure 9C). The paucity of tylosaurine material from the Southern hemisphere, as compared to the Northern hemisphere, is evident. Most of the materials from Gondwanan continents are assigned to the species of Taniwhasaurus first described as Ta. oweni from the Campanian of New Zealand (Welles and Gregg, 1971; Caldwell et al., 2005), followed by a single complete specimen plus fragmented materials of Ta. antarcticus, from the Campanian and Maastrichtian of the Antarctic Peninsula (Novas et al., 2002; Martin and Fernández, 2007; Fernández and Gasparini, 2012). Records of tylosaurines from Africa and South America are scarce (see Ta. capensis in Broom ). A specimen described as Tylosaurus imbeensis from Angola (Antunes, 1964) was unfortunately lost in a fire in Lisbon, Portugal. Isolated teeth have been recovered from central and southern Chile (Jiménez-Huidobro et al., 2015). The type of material usually known from the Southern hemisphere corresponds to isolated teeth and vertebrae, which in tylosaurines have shown some taxonomic value, recognizing at least at the generic or subfamily level, the presence of tylosaurine mosasaurs. The results presented here support a North Atlantic Circle Basin distribution for the genus Tylosaurus, following similar suggestions made by Jiménez-Huidobro and Caldwell (2016). However, species from the genus Taniwhasaurus do not show an endemic distribution as previously suggested (Martin and Fernández, 2007), but rather appear to have achieved a more cosmopolitan distribution, as demonstrated by new and previously known records from the North and South Pacific, Indian Ocean, and Antarctica. These patterns are crucial to understand the evolution of tylosaurine mosasaurs specifically, and the evolution of mosasauroids on a global scale. Future research using new data from the poorly known Southern Hemisphere would potentially help determine the relationships within Tylosaurinae. PJ-H and MC conceived the manuscript structure and contributed to the data analysis. PJ-H collected the data and wrote the original draft. MC reviewed and edited the manuscript. This research was funded by the following grants: NSERC Discovery grant (#23458), NSERC Accelerator grant, and Chair’s Research Allowance to MC and CONICYT Ph.D. Scholarship to PJ-H. This manuscript is based on the dissertation thesis of PJ-H at the University of Alberta (Jiménez-Huidobro, 2016). We thank R. Blakey, Colorado Plateau Geosystems, for the paleomap used for the production of Figure 1. The program TNT was made available by the Willi Hennig Society. We also thank O. Vernygora for providing assistance with methodologies and use of the program. We also thank N. Bardet (Musée National d’Histoire Naturelle), D. Brinkman (Yale Peabody Museum), A. Cragg and P. Garbes (Kaikoura Museum), S. Chapman (Museum of Natural History, London), J. Ebersole (McWane Center of Sciences), D. Ehret (Alabama Museum of Natural History), A. Folie (Institute Royal des Sciences Naturelles de Belgique), C. Gee (Goldfuss Museum im Institut für Paläontologie), M. Kano (Mikasa Museum), V. Markstrom (Canadian Fossil Discovery Centre), C. Mehling (American Museum of Natural History), D. Miao (Kansas University), F. Novas (Museo de Ciencias Naturales Bernardino Rivadavia), D. Pagnac (South Dakota School of Mines), K. Sakurai (Mukawa Town Hobetsu Museum), A. Schulp (Natuurhistorisch Museum Maastricht), J. Simes (Institute of the Geological and Nuclear Sciences Te Pū Ao), P. Scofield (Canterbury Museum), A. Tennyson (Museum of New Zealand Te Papa Tongarewa), T. Tokaryk (T.rex Discovery Centre), and L. Wilson (Sternberg Museum of Natural History) for proving access to materials. We also thank the reviewers JH and MY for their valuable comments and critical reviews. Antunes, M. T. (1964). O Neocretácico eo Cenozóico do litoral de Angola. Lisboa: Junta deInvestigações do Ultramar. Bell, G. L. Jr. (1993). A Phylogenetic Revision of Mosasauroidea (Squamata). Ph.D. thesis, University of Texas, Austin, TX. Bell, G. L. Jr. (1997). “A phylogenetic revision of North American and Adriatic Mosasauroidea,” in Ancient Marine Reptiles, eds J. M. Callaway and E. L. Nicholls (San Diego, CA: Academic Press), 293–332. Broom, R. (1912). On a species of Tylosaurus from the upper cretaceous of Pondoland. Ann. S. Afr. Mus. 1, 332–333. Bullard, T. S. (2006). Anatomy and Systematics of North American Tylosaurine Mosasaurs. Masters thesis, University of Alberta, Edmonton, AB. Cope, E. D. (1869). Remarks on Macrosaurus proriger. Proc. Acad. Nat. Sci. Phila. 11:123. Cope, E. D. (1874). Review of the Vertebrata of the Cretaceous Period Found West of the Mississippi River. Washington, DC: Department of the Interior. Dollo, L. (1884). Le mosasaure. Rev. Quest. Sci. Ser. 16, 648–653. Dollo, L. (1885). Première note sur le hainosaure. Bull. Mus. R. Hist. Nat. Belg. 4, 25–35. Gervais, P. (1852). Zoologie et Paleontologie Francaises (Animaux Vertébrés). Paris: Arthus Bertrand. Gill, J. R., and Cobban, W. A. (1966). The Red Bird section of the Upper Cretaceous Pierre Shale in Wyoming, with a section on a new echinoid from the Cretaceous Pierre Shale of eastern Wyoming. U.S. Geological Survey Professional Paper 393-A. Washington, DC, 73. Hector, J. (1874). On the fossil Reptilia of New Zealand. Trans. N. Z. Inst. 6, 333–358. Jacobs, L. L., Mateus, O., Polcyn, M. J., Schulp, A. S., Antunes, M. T., Morais, M. L., et al. (2006). The occurrence and geological setting of Cretaceous dinosaurs, mosasaurs, plesiosaurs, and turtles from Angola. J. Paleont. Soc. Korea 22, 91–110. Jiménez-Huidobro, P. (2016). 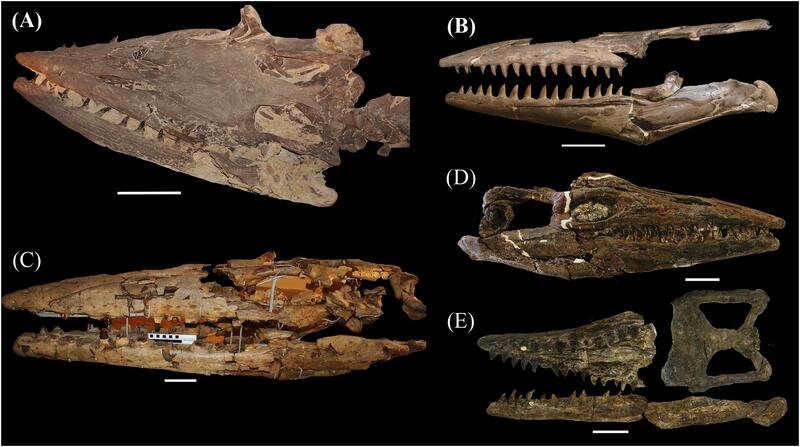 Phylogenetic and Palaeobiogeographical Analysis of Tylosaurinae (Squamata: Mosasauroidea). dissertation thesis, Edmonton, AB: University of Alberta. Jiménez-Huidobro, P., Simões, T. R., and Caldwell, M. W. (2016). 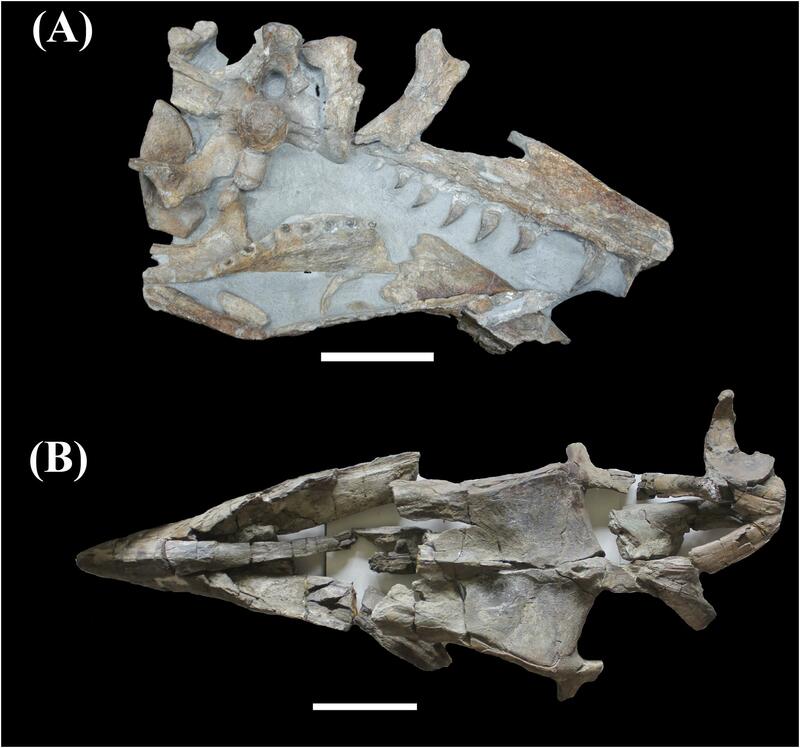 Re-characterization of Tylosaurus nepaeolicus (Cope, 1874) and Tylosaurus kansasensis Everhart, 2005: ontogeny or sympatry? Cretaceous Res. 65, 68–81. Kauffman, E. G., and Caldwell, W. G. E. (1993). “The western interior basin in space and time,” in Evolution of the Western Interior Basin, Special Paper, Vol. 39, eds W. G. E. Caldwell and E. G. Kauffman (St. John’s, NL: Geological Association of Canada), 1–30. Kauffman, E. G., Sageman, B. B., Kirkland, J. I., Elder, W. P., Harries, P. J., and Villamil, T. (1993). “Molluscan biostratigraphy of the cretaceous western interior basin, North America,” in Evolution of the Western Interior Basin, North America, Special Paper, Vol. 39, eds W. G. E. Caldwell and E. G. Kauffman (Canada: Geological Association of Canada),397–434. Lingham-Soliar, T. (1992). The tylosaurine mosasaurs (Reptilia, Mosasauridae) from the upper cretaceous of Europe and Africa. Bull. Inst. R. Sci. Nat. Belg. 62, 171–194. Marsh, O. C. (1874). Note on Rhinosaurus. Am. J. Sci. 4:147. Martin, J., Kihm, A., Fernández, M., Reguero, M., and Case, J. (2007). A juvenile mosasaur (Taniwhasaurus antarcticus) from the late cretaceous of Antarctica. J. Vertebr. Paleontol. 27:112A. Novas, F. E., Fernández, M., de Gasparini, Z. B., Lirio, J. M., Nuñez, H. J., and Puerta, P. (2002). Lakumasaurus antarcticus, n. gen. et sp., a new mosasaur (Reptilia, Squamata) from the upper cretaceous of Antarctica. Ameghiniana 39, 245–249. Persson, P. O. (1963). Studies on Mesozoic Marine Reptile Faunas with Particular Regard to the Plesiosauria. Lund: University of Lund. Polcyn, M. J., and Bell, G. L. Jr. (2005). Russellosaurus coheni n. gen., n. sp., a 92 millionyear- old mosasaur from Texas (U.S.A.), and the definition of the Parafamily Russellosaurina. Neth. J. Geosci. 84, 321–333. Robaszynski, F. (1989). “The phosphatic chalk of the Mons Basin, Belgium,” in Phosphate Rock Resources: Phosphate Deposits of the World, Vol. 2, eds A. J. G. Northolt, R. P. Sheldon, and R. P. Davidson (Cambridge: Cambridge University Press), 370–375. Robaszynski, F., and Christensen, W. K. (1989). The upper Campanian-Lower Maastrichtian chalks of the Mons Basin, Belgium—a Preliminary Study of belemnites and foraminifera in the Harmignies and Ciply Areas. Neth. J. Geosci. 68, 391–408. Robaszynski, F., and Martin, M. (1988). “Late cretaceous phosphate stratiform deposits of the Mons Basin (Belgium)” in Mineral Deposits Within the European Community, eds Boissonnas and P. Omenetto (Berlin: Springer), 515–529. Russell, D. A. (1967). Systematics and Morphology of American Mosasaurs (Reptilia, Sauria). New Haven: Peabody Museum of Natural History, Yale University. Thevenin, A. (1896). Mosasauriens de la craie grise de Vaux Eclusier prés Peronne (Somme). Bull. Soc. Géol. Fr. 24, 900–916. Welles, S. P., and Gregg, D. R. (1971). Late Cretaceous Marine Reptiles of New Zealand. Christchurch: Canterbury Museum Trust Board. Williston, S. W. (1898). Mosasaurs. Kansas Geol. Surv. Bull. 4, 83–221. Copyright © 2019 Jiménez-Huidobro and Caldwell. This is an open-access article distributed under the terms of the Creative Commons Attribution License (CC BY). The use, distribution or reproduction in other forums is permitted, provided the original author(s) and the copyright owner(s) are credited and that the original publication in this journal is cited, in accordance with accepted academic practice. No use, distribution or reproduction is permitted which does not comply with these terms.